When I think of seaside villages I’d like to visit, quaint comes to mind. My vision includes somewhere petite, void of tourists, with charming cafes brimming with fresh local specialties, small fishing boats lining the wharf, an unpretentious air, and clean, clear blue water. Do these places really exist other than some remote tropical island in the middle of the ocean? 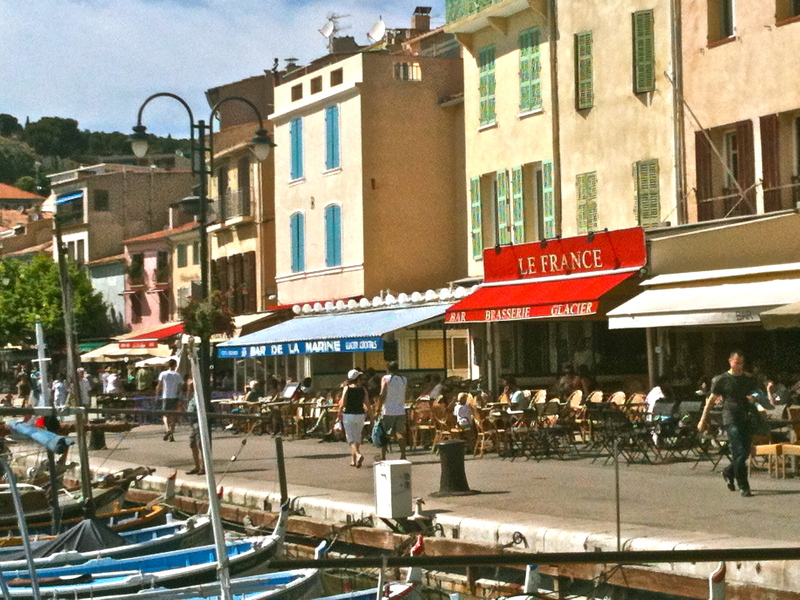 At first I thought Cassis (pronounced Casee) would be that typical touristy seaside resort. After driving through Marseille, a rambunctious sprawling city, on the way to Cassis, I realize that anything else has to be more civilized and polite. By the way, Cassis is a delicious black currant liqueur usually poured into a champagne flute followed by, what else, champagne and is called a “kir.” This dark purple liqueur originated in eastern Burgundy and is not affiliated with the village of Cassis. This fits my petite and quaint criteria. I adore the pastel colored houses which frame the wharf. The road to Cassis is windy with sharp turns and glimpses of ocean. The route we want to take called the Route des Cretes, for even more of a thrill, traverses steep cliffs overlooking the sea but is closed for construction. Disappointed, we look for other roads into the city. 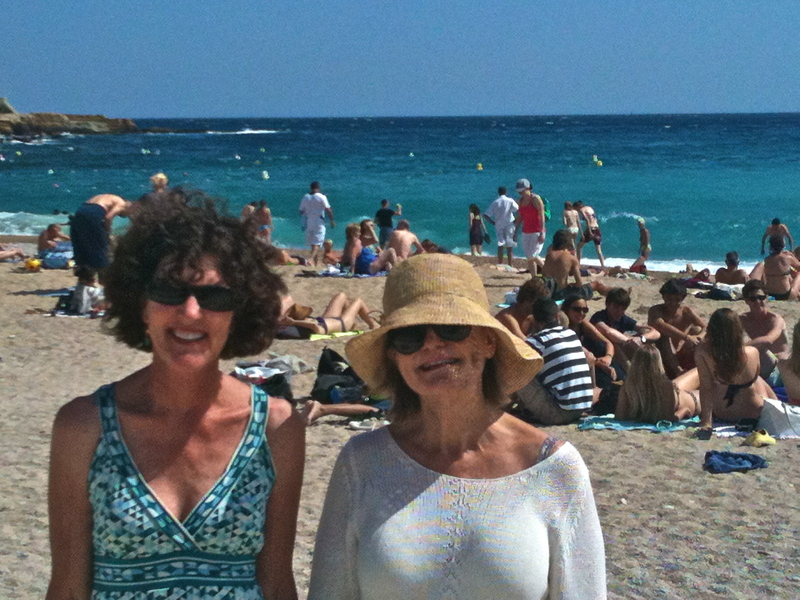 A very friendly woman gives us more directions than we can handle, and with our CD-learned French, we smile happily, thank her profusely and head downward which seemed in the right direction to the ocean. Soon we are in the neighborhood. Nous arrive! I love the view of this fortress admiring the simple, but classy ville below. Watching the other cars, we take note and park up the hill, avoiding the one-way streets and possible crowds below. We follow a steep cobblestone street, which luckily lands us smack dab in the middle of town. The ambiance is overwhelming. So many cafes to choose from. 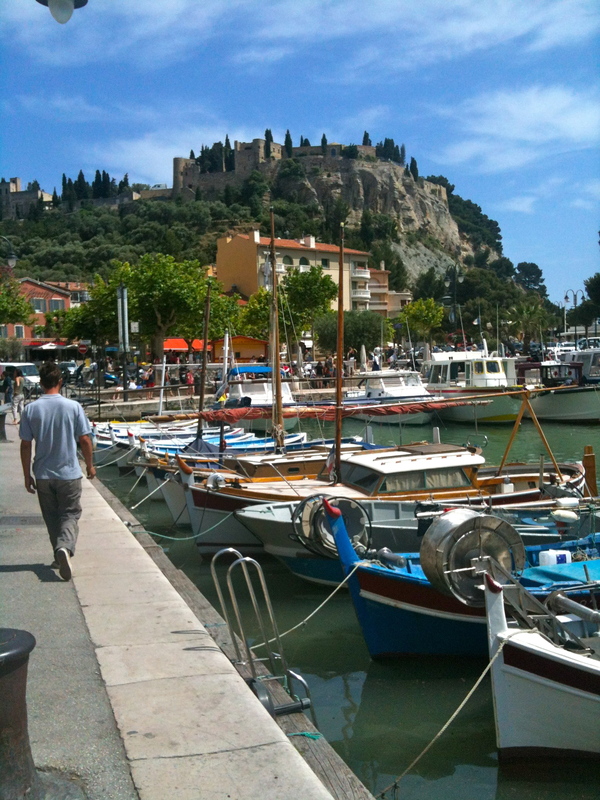 Cassis is small for such a popular seaside village. It rests at the bottom of a hill and has views of sea, sky and old fortresses. Intimate and colorful cafes line a short wharf, lined with fishing boats the size of an olive tree. To me, this is an indication that the fish on the menu is pulled out of the ocean daily. As we start to relax and settle into the warmth of the heating sun, we notice that this is not a tourist magnet. Café tables are filled with locals congregating for lunch. The vibe is low key and not frantic. Life slows down a notch. Eager for a seafood lunch, the restaurant we choose with the tastiest menu selections will close soon so we cannot be seated. The French definitely adhere to their lunch and afternoon time off schedules. 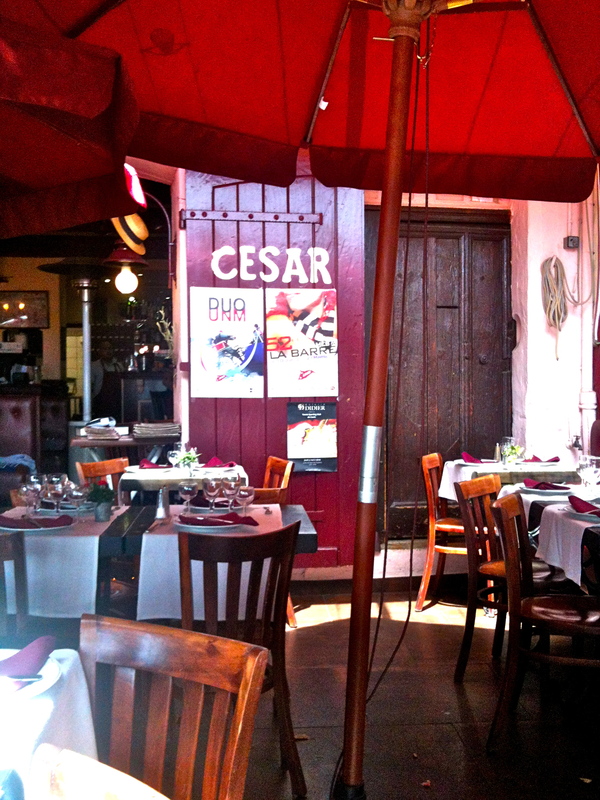 A few cafes away, Café Cesar is happy to accommodate us. The menu looks basic, but basic it is not. Naively I order a shrimp cocktail and Bonnie an octopus salad. While waiting for our lunches, delicious aromas fill the air and our eyes follow the platters coming out of the kitchen brimming with fish and sauces and heaps of prawns and mussels. Blatantly, we stare at the table next to us and wonder why we didn’t order what they had. When our plates arrive, we are pleasantly surprised to see chunks of strikingly purple octopus and salmon colored prawns generously piled high on a bed of fresh, green, gorgeous lettuce, drizzled with a tangy and flavorful dressing. 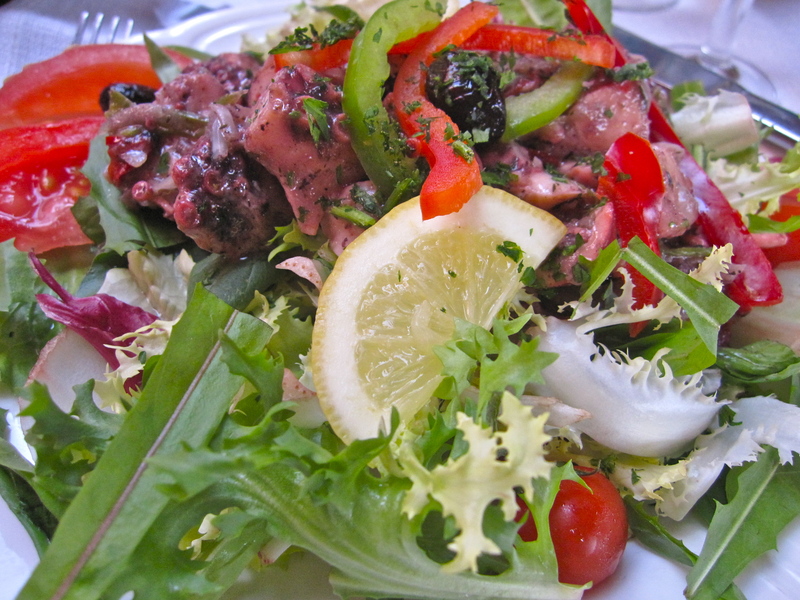 All the salads we have been fortunate to eat in France have been artistically presented and hearty. The octopus melted in your mouth – so tender and gushing with flavors of herbs and vinegars. Merci for the delicious dejuener! I ordered a shrimp cocktail and this is what I got! Incredible and the crevettes (shrimp) taste of a clean and fresh sea. The ocean sits a short walk from the cafes. There are smells of suntan lotion and briny sea air. Squeals of joy and sounds of giggling and laughter provide the accent for the splashing waves in the background. Scantily clad men and women of all ages relish in the sunshine and warm water. Groups of friends gather to enjoy a day at the beach. I know there are tourists here, including us, but it seems more local than “touristy.” The Mediterranean glistens with hues of aquamarine blues and greens, sharing its saltiness in the breeze. Yes, this is a place I could spend a few days. Such a gorgeous day to spend with friends. We try to fit in but really needed to be in bathing suits! After dipping our toes in the warm water, and soaking up a few rays, I am now hungry for ice cream. It seems like everyone is carrying a cone of some sort, stuffed with chocolate, vanilla and other flavors of the south. 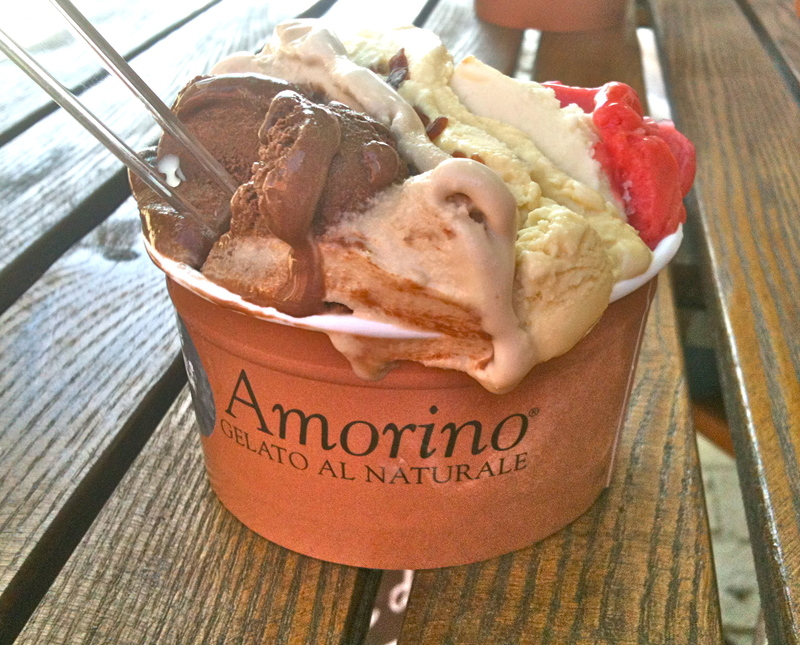 On the main street, a gelato shop called Amorino catches our eye with the colorful ices in the window. You order by the size of the container and can choose as many flavors as will fit into that size. I think I squeeze in about six tastes ranging from noisette and strawberry to coffee and nougatine. Every melting bite is delicious. Every region has its own specialties and shops that show them off. I am lured into one by baskets of perfectly shaped cookies with flavors of anise, rosemary, chocolate and lemon. 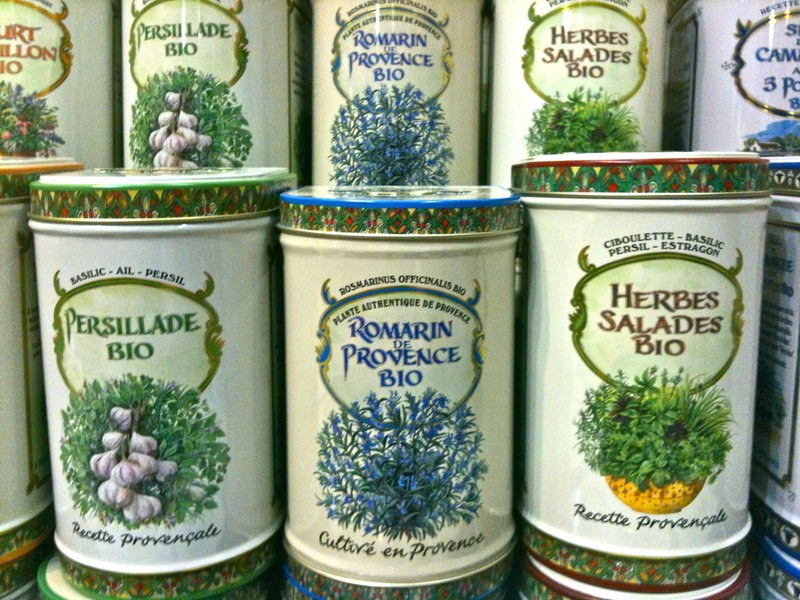 Local olive oils and vinegars, herbes de Provence, lavender and jams also line the shelves. I buy a 4 oz. bottle of lemon basil olive oil that has a spray top so you can mist your salads. I also purchase rose wine vinegar infused with herbes de Provence with the same spray top. So clever. The creative packaging shows the typical French artistic flair. 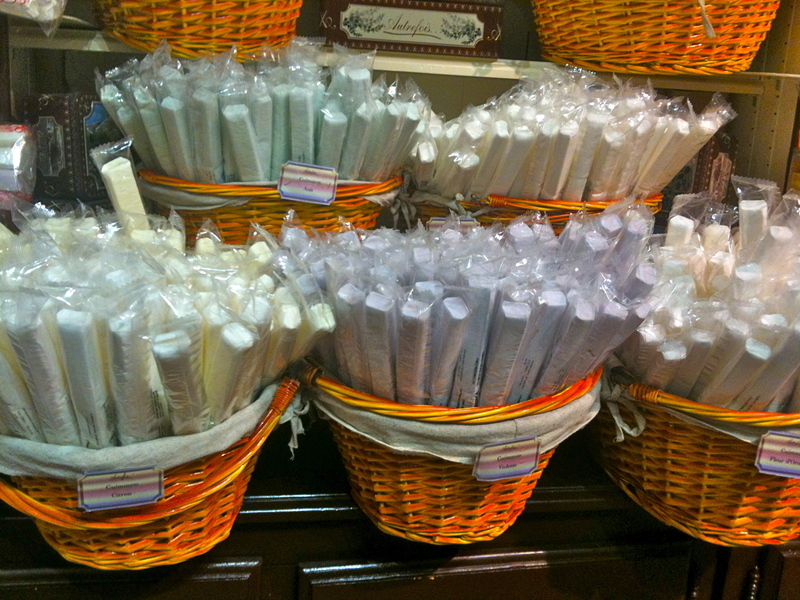 Rows of jams, baskets of marshmallow sticks, and tins of dried herbs have my camera clicking. What I like about stores like these is they are not a chain and an artisan is in the back, creating all the edible showpieces for which Provence is famous. 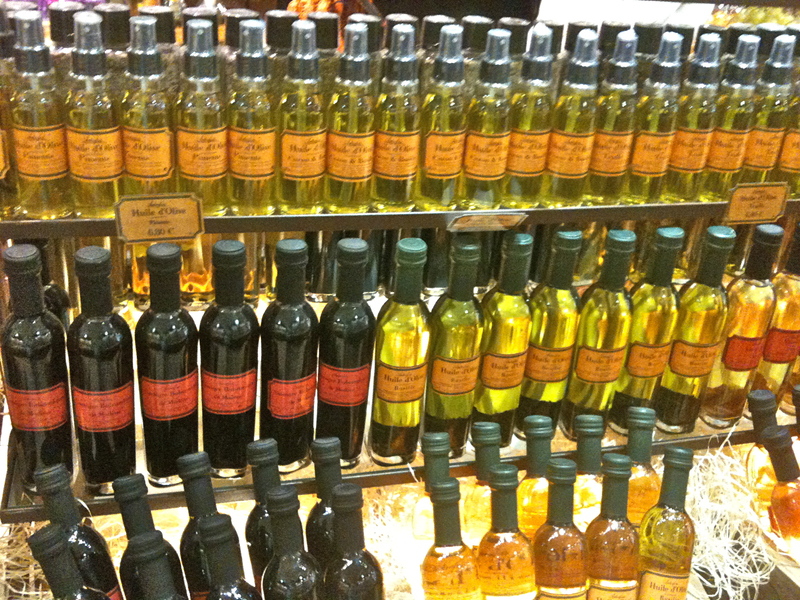 A terrific selection of pungent oils and tangy vinegars awaits us. I love the packaging and especially love that these herbs are local and organic. 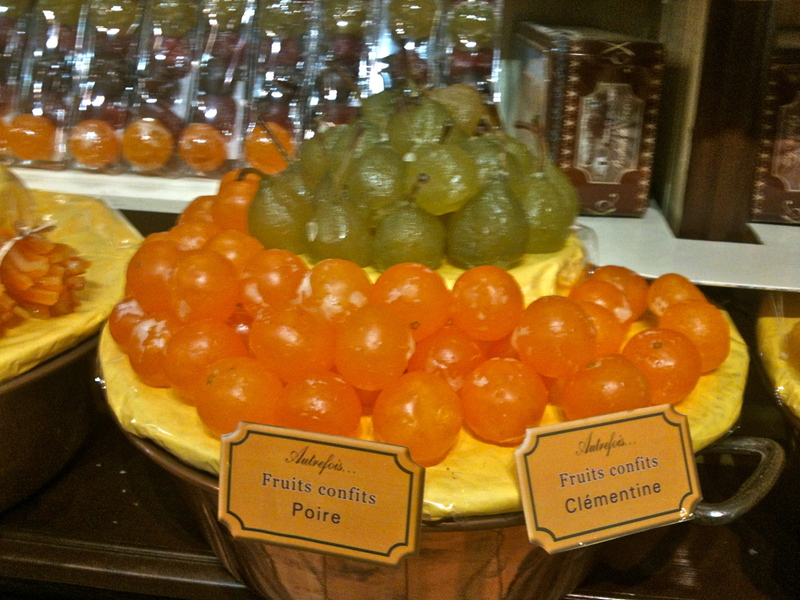 Spectacular candied fruits are a specialty of the region. Our day in beautiful Cassis has ended but leaves us with fond memories of a relaxed and laid back fishing village, full of color and warmth. I will return. 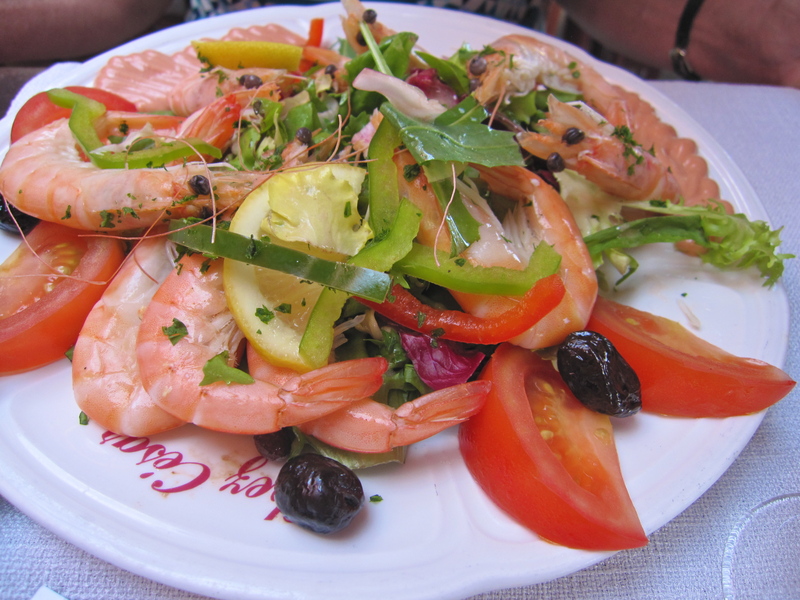 Look for my weekly posts on food and travel in which I will share more stories of France and soon-to-come recipes. I can smell the salt air and i want a taste of the wonderful gelato. Oh for seafood right out of the sea that day.I want to book my flight to France. Thanks so much for your comments. I too want to return to the land of fragrance and freshness. 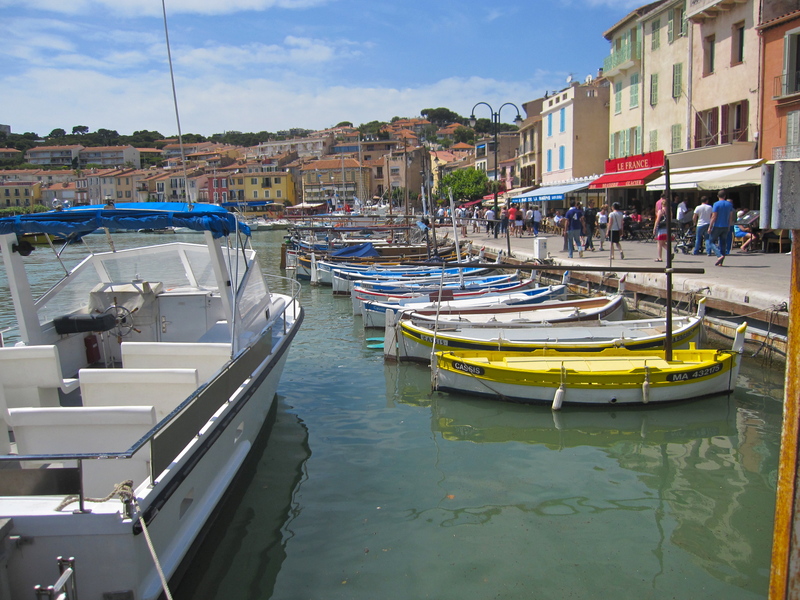 Cassis is a very special little parcel of hidden surprises. I hope your travels take you there someday soon! Oh my goodness! I want to BE there! What a heavenly place among many heavenly gastronomic delights. Do they have an “old folks home” there? I’m signing up!! I’m so glad you are enjoying my stories. It is such fun to write them! Hopefully this passion will continue for a long time. Thanks again. 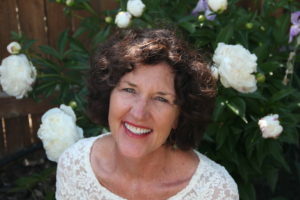 I very much appreciate your support! Thanks Nicole! That is a complement, coming from you. 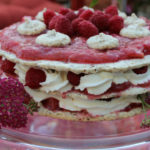 I get so excited writing about food, testing recipes and re-living my times in France. 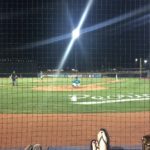 I’ll keep the words flowing….